Should My Teenager Get A Debit Card? It would require him to exercise a new level of financial responsibility through keeping track of deposits and purchases to know his balance. If he wanted cash to go to a football game or somewhere that didn’t accept debit cards he would have to go to an ATM. We decided that the Pros outweigh the Cons and decided to go ahead and get him a bank account with a debit card linked to it. This account would be separate from his savings account, which I don’t want him to be able to touch. For times when he does need cash, I may be able to give him cash I may have on hand and electronically transfer funds out of his account. As a parent, I’m most excited about the prospect of him taking more responsibility for his finances, while still being able to monitor what he’s doing with his money. It allows him to grow up a little, while we’re still able to help him identify and correct mistakes while the stakes are relatively low. 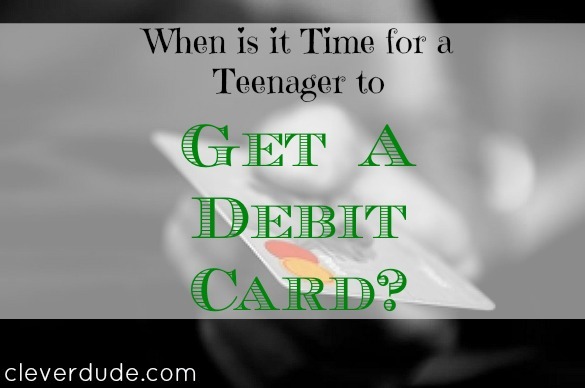 What do you think, is fifteen old enough for a teenager to have a debit card? I think this is great. I opened my first bank account and received my own debit card at the age of 14. All of the money was mine that I earned and it taught me a lot about my finances. Yeah I think 15 is a great age to start with something like this. As you say, as long as you can still monitor what he’s spending his money on then it is all part of the financial growth process. I got my debt card around that age too, mainly because Walmart and lots of other places started giving checks back and running them electronically anyhow. I had my first debit card with my first bank account, which was opened when I was around 5. I didn’t have the pin or anything until I was ~12, but it was handy to have. Sounds like a good decision for your son! @Michelle – I had my own bank account as long as I can remember, and when I was in high school although I didn’t have a debit card, I did withdraw and deposit money as I wanted. I think a debit card brings an extra level of discipline to the game, and I think it will be beneficial. Glad to see it worked out well for you! @Adam – that’s the key, as long as I can still check periodically to make sure he continues to be wise with his money, and have a few teaching lessons along the way, I think this is a step in the right direction. @Kayla – When I was in high school, it was all cash – I didn’t have checks for my account. Although checks are increasingly becoming useless as many businesses don’t accept them anymore, and many that do (as you mentioned) process them immediately anyway. @Daisy- Thanks for sharing – sounds like teenagers having a debit card isn’t all that uncommon these days!